Hello and welcome to my Capita Kazu Kokubo review. In this review I will take a look at the Kazu as a powder snowboard – though it’s kind of unique for a powder board as I’ll explain later. As per tradition here at SnowboardingProfiles.com I will give the Kazu a score out of 100 (based on several factors). This is where I’d normally do a comparison to other boards in the same category. However, the Kazu is quite a unique board in that it’s really powder-freestyle and I don’t have any boards that would make a proper comparison to. Check out the tables for the Kazu’s specs and available sizes. Who is the Kazu Most Suited to? This board is essentially for anyone who wants to rip freestyle in the backcountry. You can definitely ride it in the resort – but where this board excels is in the powder. But it’s not your typical big surfy powder board. It’s a small freestyle board designed to ride the powder. So if you like to do tricks – especially jumps – in the backcountry and you want the board to be nimble and maneuverable at the same time (as opposed to big and surfy) then you’ve probably met your match here. If you know the type of thing that Kazuhiro Kokubo likes to get up to in the backcountry (see 1st video below for some examples) then that’s what this board is capable of. This maneuverability and powder prowess also makes this board great for the trees. Definitely not for a beginner and not a one-board quiver (unless this is the only type of riding you want to do – which would be understandable!). O.k. let’s take a more detailed look at what the Kazu is capable of. Very effortless keeping the nose above the powder/slush that I found. Felt like it had very good float – particularly for a 157. They’ve done a great job of making a small powder board – it’s not a surfy feel in the powder but you don’t have to work to keep the nose above the snow at all – floats above nicely. It’s a great little carver. In terms of wider carves I’ve ridden better but it’s still definitely good. In terms of edge-to-edge speed this thing is super quick for those fast tight turns – especially considering it’s a powder board predominantly. It was really nimble and maneuverable on the hard pack and felt really at home on the slushy, soft spots too. Super quick. Even though I had slow conditions you could feel it was quick. And if you point and shoot down something steep enough you get up speed! And the Kazu was up for it. Felt really stable. It’s got all the camber right back to the tail which adds to that stability. The only rocker is up in the nose for powder float. The base is super quick too – even in slow conditions it glided well on flat spots and up-hills. On some boards I would have been stopped on some of those spots, especially in those conditions but the Kazu had good glide. This board isn’t overly stiff. It’s designed for freestyle in powder – so it’s not overly stiff. That, IMO, helps it over bumby terrain. It’s not the best I’ve ridden in this area but it was definitely decent and better than most powder or freeride boards. Heaps of pop, heaps of stability on landings. This is made for big jumps and cliff drops in the backcountry, so it’s supposed to be good at that – and it doesn’t disappoint. You can even take it through the park and hit some large jumps in there. But despite all of that it wasn’t actually too bad. I felt like it should feel worse than it is – but it’s actually kind of doable – I mean it certainly doesn’t ride switch like a true twin, centered stance board – but surprisingly good given it’s specs. The Kazu Kokubo Pro is new for 2017. Overall this board is what it says it is – a freestyle powder board. Great for jumps and great float in powder – but also a good carver and very nimble and fast from edge-to-edge. It’s perfect for anyone who wants to play in the powder but wants to play with a shorter, smaller board and wants to do some freestyle in the backcountry. But it’s surprisingly nice on hard pack too – it’s got really decent edge-hold and it feels nimble and maneuverable on hard pack. Also great through trees. I really had a lot of fun on this board. If I had to sum it up in two words – light and lively. If you want to learn more about the Kazu Kokubo, are ready to buy or want to research prices and size availability, check out the links below. great review! How would you compare it with the 2018 Kazu, some say a bit stiffer so even more in the all-mountain direction, making it even more interesting. Thoughts on that? Unfortunately I didn’t get a chance to ride the 2018 model, so I couldn’t say for sure – but they are supposed to have stiffened it up marginally. Capita rates the 2018 model 6.5/10 and they rated the 2017 model 6/10 (which I would say was pretty accurate). So yeah, supposed to be a little bit stiffer but I couldn’t say for sure. Still haven’t tried the 2018 one dude? No, unfortunately haven’t had a chance to ride the 2018 model yet. From your experience from the previous model, what will be the best size ( for 2018 model) for height 165cm and weight 70kg in order to float easily in pow but also carve through the trees and play in the park a little? I’d say the 151cm would be the best size for your specs. I would put you on around a 152 for an all-mountain board – and 153, 154 for a more freeride/powder oriented board. However, this is the kind of board, IMO, that you go a little shorter for. And for the trees and the park the 151 is going to be a much better size for you, IMO than the 154. And even though the 154 would float better in powder, I’d say the 151 would do a good job for your specs – and certainly better than other boards that aren’t as oriented for powder as this one (it’s got a big wide nose (296mm – which is rather wide for a 151) that’s rockered up and a narrower tail, and it’s camber right back to the tail – this board is designed to sink the tail and raise the nose). But yeah, long story short, I’d definitely say 151 for you. You are the best. Cheers. You’re very welcome Mike. Hope you’re having/continue to have an awesome season! Dear Nate, I am 176cm (5’8″) and 67kg (148 lbs) and not a particularly powerful rider (long thin legs). I wanted a board more focus for mostly Japow and some all mountain. Would you recommend the Mercury 155cm or the Kazu? And which size for the Kazu? 151? 154? Thank you very much! I think the Kazu would be better for Japow. Also it’s maybe a little softer flexing. On paper Capita rates Kazu 6.5/10 and the Mercury 7/10 for flex. The Mercury by my feel is more like a 6.5/10. The Kazu feels stiffer in hand to flex – more like a 7/10, but on snow felt more 6.5/10 or even 6/10. So, flex-wise (going with the fact that a little softer means it should be easier to power if you don’t have that much power) the Kazu might also be a little better. Overall, I would go Kazu for you, based on what you’re describing. Size-wise, you’re on track with 154 or 151. Both would work but there are pros and cons to both sizes. The 151 would be more maneuverable and easier to power than the 154. 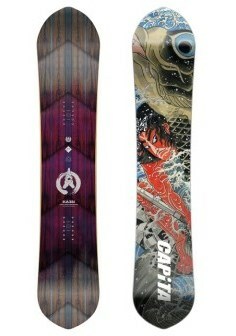 The 154 would offer better float in powder, better stability at speed and better for long wide carves. Thank you so much Nate, you are a legend! You’re very welcome Jeremy. Hope you have an awesome season!